The trend for smaller borders is not only about device aesthetics; consumers want larger displays without necessarily having to carry a larger device. In smartphones for example, several methods have been employed in order to reduce the effective or actual bezel size, such as the use of integrated drivers also allow smaller borders. A second approach is to use cover glass that includes refraction or lensing effects at the edge of the flat display, to give the optical effect of a reduced apparent bezel. A third approach to reducing apparent border is to use flexible AMOLED displays which allow the display area itself to be curved away from the viewer at the edge of the phone, thereby reducing the projected border when viewed from the front. This approach was first shown by Samsung in their EDGE phones in 2014. The trend to reduce bezels is present in other devices such as notebooks and tablets for exactly the same reasons. Many notebooks and tablets today can have bezel sizes up to around 1-2 cm on each side. Removing these bezels could nearly allow a 15” display to fit into today’s 13” notebook casing! Some notebooks with glass displays have smaller borders than this today (3-4mm), but it is recognised that going much smaller requires flexible displays. However, unlike for flagship smartphones, flexible OLED displays cannot be viably employed in large area CE display products because of the high manufacturing cost today. FlexEnable has developed a complementary flexible display technology, known as Organic LCD (OLCD). OLCD is cost-effectively scalable to large sizes, and makes use of existing supply chains, keep implementation and production costs low. OLCD is made possible by the use of organic transistors built directly onto plastic sheets, in place of the usual silicon built directly on glass. These organic transistors are incredibly flexible – they can be folded down to a few hundred microns without affecting them. Right: an OLCD borderless notebook concept image. By exploiting this unique mechanical property of organic electronics, it is possible to make displays of any size almost completely borderless by folding the borders. 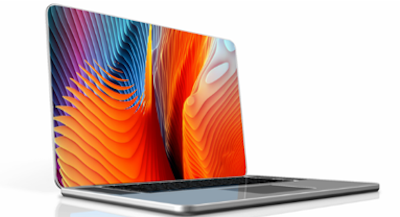 OLCD brings huge value not only in conformable and shapeable displays in smart home, automotive and beyond, but also in flat-display applications like notebooks where borderless means bigger displays for the same sized notebook.